The year 2018 witnessed many changing trends in the world of content marketing. With many new people joining the club, it has also become one of the most popular and effective methods of Digital marketing. The digitalization of the world has made it nearly impossible for any middle sized business to survive without an effective digital marketing strategy. It is the widely accepted and effective to help your business grow when implemented correctly. Content is one of the most important parts of digital marketing and also, without marketing, content is just stuff. Therefore, the two of them go hand in hand for effective results. As the New Year approaches, it’s a great time to redefine your content marketing strategies and look at the mistakes you’ve possibly ignored during 2018. Pledging various resolutions for New Year is a common practice. However, breaking those resolutions soon after you make them is also common for most of the people. But, unlike the personal front, New Year resolutions for your business should be taken more seriously. Moreover, the sense of accountability you will have towards them would help you in realizing your goals. 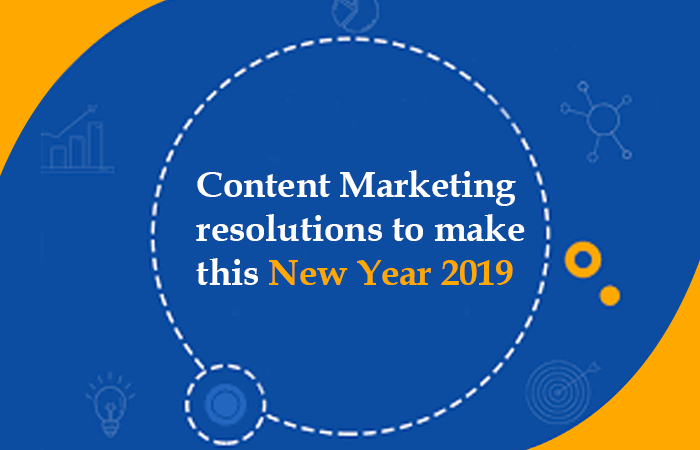 Therefore, some smart content marketing resolutions for this New Year is a great idea to kick start 2019. We have listed a few productive content marketing resolutions that you can make this New Year. If followed sincerely, your marketing strategy will surely yield great results. Check them out! Blogging is one of the indispensable parts of marketing. In the journey of establishing trust between you and your prospects, regular blogs play a major role. Pledge this year to blog regularly and more frequently. The frequency and regularity of your blog will help you in keeping up with new trends and engage with your audience more effectively. Consider planning with a proper content calendar and decide the blog topics beforehand. Frequency and consistency of the blogs plays important role in bringingthe overall positive results in digital marketing. As said already, without marketing, content is just merely stuff and the world already has too much stuff. Therefore, with relevant, quality and engaging content, it is also important that you promote your content well. A good content that does not reach the target audience on time is of no use. Social Media has become one of the key tools and a great tactic in reaching out to the target audience widely. Use it to the best in order to stir up the interest of your target audience in reading your content. Social Media promotions, paid advertisements, cross-promotion within content, etc can be helpful in promoting your content to the right people at the right time. Updating your social media accounts with quality content would revamp your engagement with the potential clients and will open several new opportunities for you. Aim at posting at least two Facebook posts and three to four tweets per day. Linkedin also serves as a great platform for sharing relevant and quality content. Make sure you use each of these platforms to its best and keep your social media accounts more lively and active. With certain shifts in the digital marketing, visual content is seen to attract the attention of the more number of target audience. As the visual content is more appealing, brief and quick to attract, you must consider adopting the visual content strategy in your content marketing this year. Platforms like Instagram and Youtube play a major role in promoting and publicizing the visual content and are seen to attract a great number of prospective customers. Therefore, using these platforms for your content marketing can grant you some additional benefits. This is perhaps the new trend n the content marketing world. People are less interested in watching the advertisements and reading plain content than they are to read the custom content. Adopt the storytelling strategy in your content marketing and improve the quality of your content while attaining more readerships. Create custom content about your website, business or anything and narrate it like a story. No matter how much content you produce, it all remains of no use if you don’t relate with your customer or reader. Engaging the reader with your content is one of the biggest challenges that the content marketers face in their careers and once they cross this hurdle, they are set for achieving the long-term goals. The countdown to the New Year has already begun. The passing year saw a huge rise in the popularity and increasing importance of content marketing. There are several new trends to watch out for the coming year. Each year brings with it a new change in the content marketing strategy. What you can do is to prepare yourself for the change. We have marked our calendars and have decided our content marketing resolutions for the Year 2019. When are you making yours?